13 Years of UCF Student Designed Artists’ Books showcases winning entries from the UCF Libraries Special Collections & University Archives’ Annual Book Arts Competition. 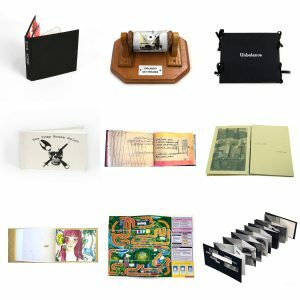 Artists’ books are works of art that use the structure or function of a book or book-like objects. While most artists’ books are published in limited editions, the works featured in this exhibit are one-of-a-kind objects. The annual competition, open to all UCF undergraduate and graduate students, encourages students to explore the world of artists’ books by creating their own works. Each year’s winning entry is added to Special Collections & University Archives’ Book Arts & Typography Collection. The exhibit is located on the 5th floor of the John C. Hitt Library on UCF’s main campus.